While there are many "upsides" to changing an old, unsophisticated, sloppy front suspension to a modern one, there are a few "downsides." Obviously, you have to contend with all the intricacies of cutting/welding frame members to accommodate the new suspension, but we accomplished that previously without resorting to slashing our wrists. That left us with only two major "downsides." First, we would have to re-engineer the radiator support — and the radiator itself, for that matter — and that will be the subject of a future article. Second, we had to create a way to steer the car! 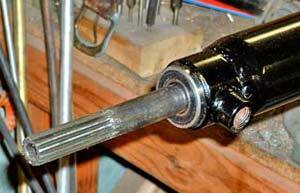 The new steering rack, with all its inherent advantages, would just sit there and occupy space unless we figured out a way to modify the old steering system to mate with it. 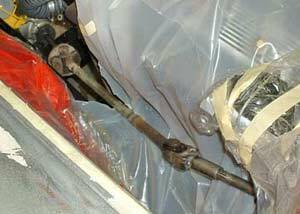 After all, we removed and discarded its worm-gear steering box, Pitman arm and linkages, so all we were left with was the steering column and central shaft. Since there was no turning back, it was time to cut. 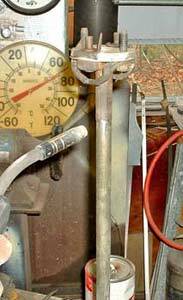 After measuring we found that the steering column came down at a horizontal (approximate) angle of 20 degrees to the centerline of the rack's shaft and a vertical drop of eight inches, which translated to an angle of 25 degrees. 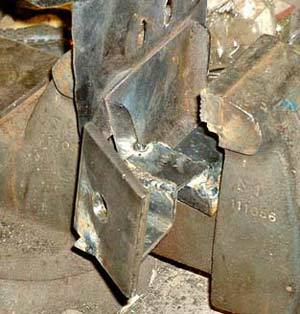 Both measurements were made from where the column exits the firewall, since common practice in designing steering linkages is "the longer the better." The reason: the longer the distance the less acute the angles, hence the least number of u-joints and less need for an intermediate bearing support. By the way, three u-joints automatically dictate the use of a center bearing support, so you want to shoot for only two. Our measurements showed that two u-joints would easily accommodate the angles. All we'd need to do, therefore, would be to find a suitable linkage system and modify the steering column to accept it. As luck would have it, a Mustang II steering linkage came up on Ebay and since we knew it would fit the steering rack we bought it. Meanwhile, we turned our attention to the column. Here's the original column, assembled as it would be in the car. We cut the outer shell of the steering column to just enter the engine bay showing a few inches. The column shell is being trimmed. 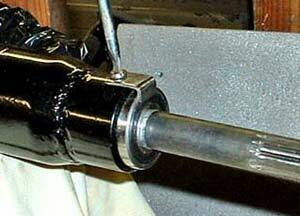 The steering shaft with its upper bearing. We then looked around for a suitable bearing retainer for the [new] column bottom so that the inner shaft would be carried at both ends. An old shock absorber eye-end proved to be a good candidate, so we machined out enough of the inner diameter to create an interference-fit for the bearing's outer race. This old shock absorber eye is just the right size and thickness for our needs. After machining, the new part is now ready for welding into place. The new bearing is pressed onto the column at the top. Its twin is poised for insertion of the shaft at the new fitting on the bottom end. 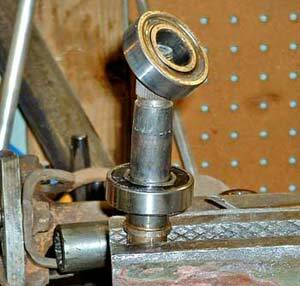 Here's a nifty way to press a bearing onto a long shaft. 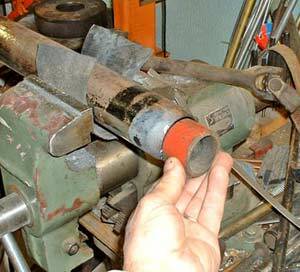 All you need is the right diameter piece of scrap pipe and some gentle tapping. While the freshly-machined and fitted column cooled from being powder coated we started work on the bracket that would hold the bottom of the column. Now doesn't this look spiffy? More important, it will work! Here's the new, powder coated column ready for installation. 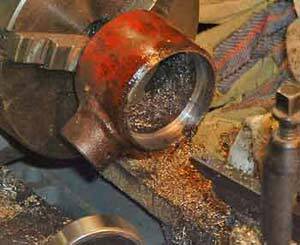 The shaft is now inserted through the bottom bearing. Although the bearing is pressed into the new fixture, we decided to make a couple of retainer clips. Besides, they look good! We fashioned a stiff (thick) metal bracket that would mount perfectly below the battery tray. After test-fitting and a few adjustments with the grinder it was ready for powder coating and installation. Here are two of the three pieces that will make up the bracket, before welding. The finished bracket, ready for test fitting and installation. Note the hole for the bolt that will fasten it to the node on the fixture at the end of the column. The finished bracket, now welded to the battery tray, has just received fresh powder coating. It's going into the oven for curing. 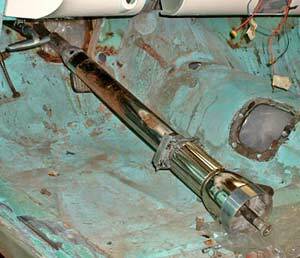 Those familiar with '55 T-Birds will, no doubt, question how the steering shaft modifications will allow us to utilize the original telescoping column feature. They won't! 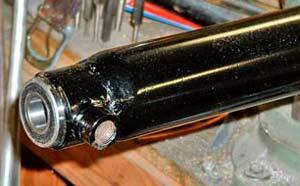 Since the inner shaft originally slid in a splined coupling on the steering box and now the shaft will be rigidly mounted on the new linkage, the column will not telescope. We decided that this feature isn't all that important, so we agreed on a fixed position and went from there to the rest of the project. If, in the future, we really need a telescoping capability we can invest about $300 in telescoping linkage components. Okay, with the column now sitting rigidly we could turn our attention to the linkage. 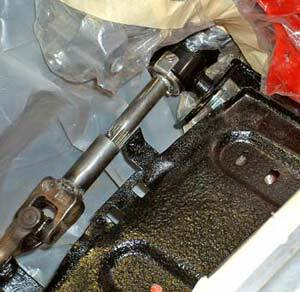 The Mustang II parts had arrived and we test-fitted the flex coupling end to the steering rack to make sure it would work. 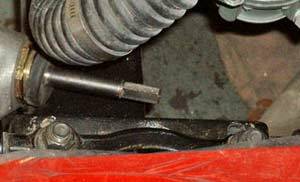 We also cut a piece from the old steering box spline (that fortunately had remained on the steering shaft) and welded it to the top u-joint of the linkage. 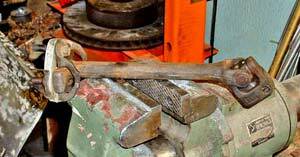 Here's the original Mustang II linkage, ready for alterations. That's only surface rust, by the way. 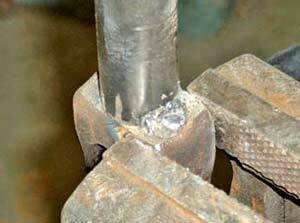 The spline is being welded to the top u-joint on the linkage. 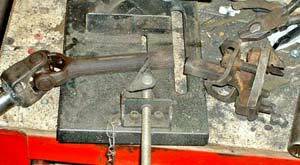 We then cut the linkage bar and welded in sufficient new bar stock of the same diameter to make the resulting linkage the correct length, test-fitting everything several times. The severed linkage is ready for lengthening. 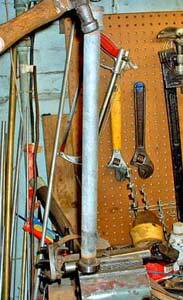 The new, added shaft is ready for the welder. You can't see it, but there's a bar magnet on the other side holding the two pieces in proper alignment. The newly created linkage is in place and the car steers just fine. Here's a view of the linkage and how it's connected at the top. The whole assembly is firm and strong, with no movement when you turn the wheel. Since this assembly is easy to remove and install we're going to leave it alone for now so that we could move the car around easily. We need to steer the car on and off the lift for a while, so this will be a chance to test how well the modifications work. Once we get to the final assembly stage of the car we can take off the linkage and make it pretty. Oh yes! 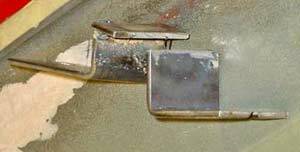 Those of you who notice that the brake line fittings [showing in the last photo] are quite close to where the battery sits will be pleased to know that the battery is going to be relocated to the trunk. 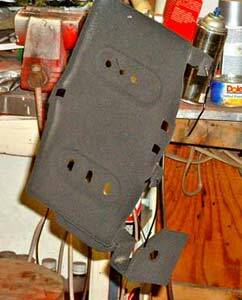 We have plans for the battery tray, so stay tuned to see what we do . . .